Addressing the challenges in advancing diversity, inclusion and equality across Silicon Valley and the tech industry. In March of 2014, Reverend Jesse Jackson and the Rainbow PUSH Coalition re-launched its Silicon Valley Digital Connections Initiative. 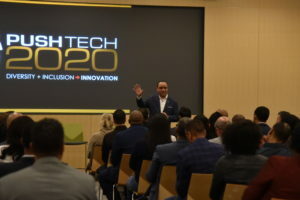 Drawing on the part of V 1.0 in 2000-2005, the goal of the Digital Connections Technology initiative is to expand the participation of Blacks and people of color – commensurate with our consumer base and population – in all dimensions of the technology industry. Inclusion of minority owned financial services firms in 401K retirement plans, debt offerings, IPOs and other financial transactions. 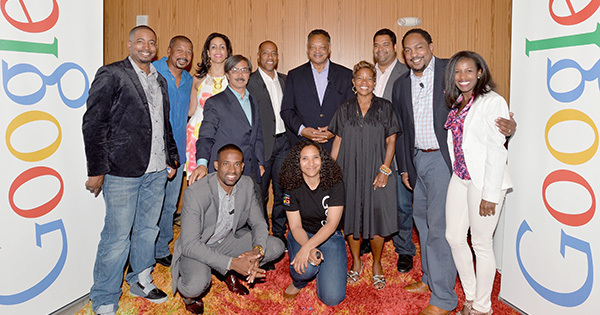 We want to accelerate the inclusion of people of color in VC and investment companies. In just a few months, Rainbow PUSH’s advocacy and public engagement has created a new climate of change is sweeping through Silicon Valley. It’s the civil rights imperative of this era. In a direct dialogue with David Drummond and leaders of Google at their meeting in May (see video below), Google responded directly by saying their were wrong not to release their data to the public, and committed to doing so. Rainbow PUSH commended Google for releasing their data, and then challenged through a Open Letter and direct communications to Yahoo, LinkedIn, Pandora, eBay, Apple, Salesforce, EBay, Amazon, Yelp – 20 companies in total – to follow this “transparency movement, to come out from under the veil of secrecy, and release their EEO-1 and workforce data. Within weeks, Yahoo!, LinkedIn, Facebook, Salesforce, Microsoft, Verizon, Comcast, and ATT responded positively. Launching an online petition drive, and using social media and Twitter to challenge Twitter’s secrecy (read announcement), the Rainbow PUSH/Color of Change campaign delivered 25,000 petitions to Twitter in 5 days. Twitter released their data last week, and now eBay has joined in. VMware released workforce data ONLY regarding women in their workforce, astonishingly omitting any reference to the racial composition of their employee base. To their credit, Intel, HP and Cisco have long posted their EEO-1 workforce data on their websites. The community has its goals and targets: inclusion on the boards, in the c-suites and in the workforce at levels comparable to our consumer use and population. There should be minority inclusion in financial and professional services, marketing and advertising, procurement and supplier diversity. The community has timetables: each year, we will measure the outcomes and progress, or lack thereof, of the tech industry’s inclusion and diversity practices. Silicon Valley must evolve and expand to look like America, and mirror American values and principles. We must even the playing field and play by one set of rules. Let’s close these gaps together. Let all of share in America’s growth and opportunity. Let’s win together.